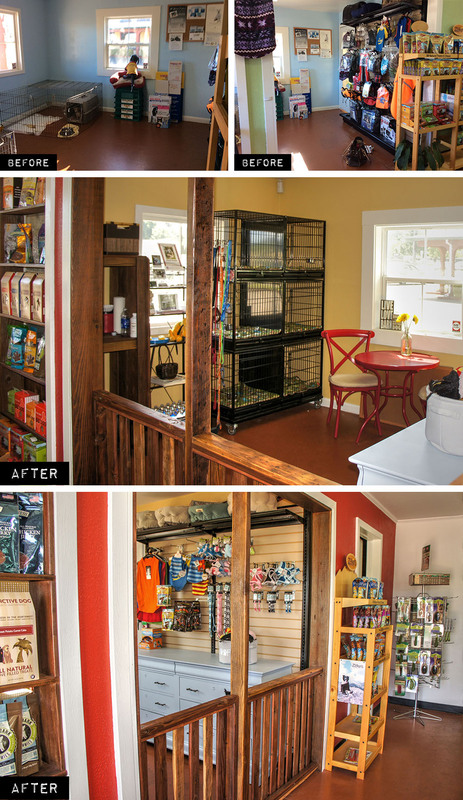 I’m excited to share the before and after transformation for this retail redesign, commissioned by the new owner of a Sonoma County pet store. 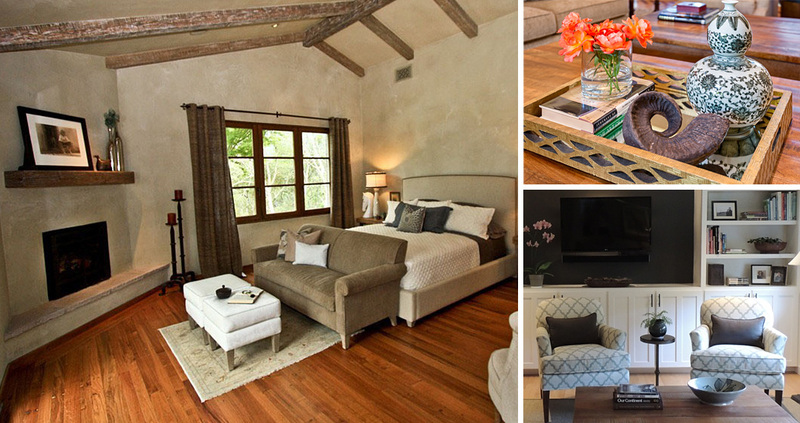 My goal was to create an environment that felt modern and sophisticated, grounded in wine country rustic. The interior color palette needed to complement and balance the exterior colors (something we couldn’t change). Enjoy the before and after loveliness below! Features: Corrugated steel framed in barn wood and topped with galvanized steel; new overhead lighting; brand identity integration; new paint reflecting brand colors. Features: New barn-style gated barrier and seating area so dogs and prospective adopters can freely get acquainted; new wood-trimmed merchandise display shelf outside the entrance; merchandise area featuring everything needed for a newly adopted dog, displayed in and above an upcycled dresser; new paint reflecting brand colors. Features: Lightweight sliding barn door conceals storage and adds character; new paint reflecting brand colors. Features: New wood-trimmed storage cabinets with overhead shelves; barn-style dutch door; non-slip floor; everything needed to beautify a four-legged customer in a spa-like atmosphere. Features: Barn wood texture with a flourish of elegance and whimsy complements the interior vision. Logo colors set direction for the interior colors. Cycling the wine country from the perspective of a newly certified True Colour Expert™. Is it taupe or is it pink-beige? 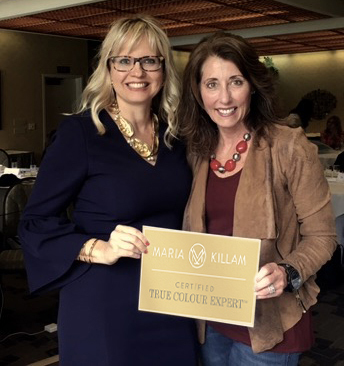 I recently took a color course from Maria Killam, a True Colour Expert, to gain confidence in selecting interior and exterior color for clients. 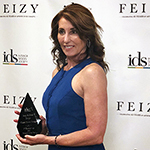 I thought I had a good understanding about color and made informed decisions specifying colors that complemented the home and its furnishings. Oh boy, is there a lot more to learn! I am a cyclist. I love riding my bike in Sonoma County enjoying the beautiful scenery and homes along the way. On a recent ride I found myself observing the homes and buildings a bit differently — I was looking at the COLOR of each rather than the property. Is that home taupe or is it pink-beige? I was applying my new skill of defining the undertone of color first. You see, if you understand the undertone of color, an informed color selection will be made. During my 35-mile bike ride I concentrated on the color of each home and challenged myself to get it right. At that point, I wish I had my big color boards with me to test my accuracy. The color of a yellow house or blue house or green house is obvious. I am talking about the “neutral” colors. Is there truly a single neutral? Probably not, as each neutral has an undertone. There is yellow beige, pink beige, orange beige, and gold beige. And there is green-grey, blue-grey, and violet-grey. What about taupe? Taupe is a grey-beige that is violet or pinky in undertone. And here comes greige. Greige? A newer defined neutral that is white with a grey undertone. It goes in the neutral category because it is not really a white. You are probably wondering, well how do you determine the undertone of a neutral? The only way to truly understand the undertone of a color is to hold the color chip next to a true white or compare it with another neutral. The undertone of the color will be obvious. As you become more experienced and skilled with color, seeing the undertone will come naturally. Yep, you’ve heard this before. It’s true. 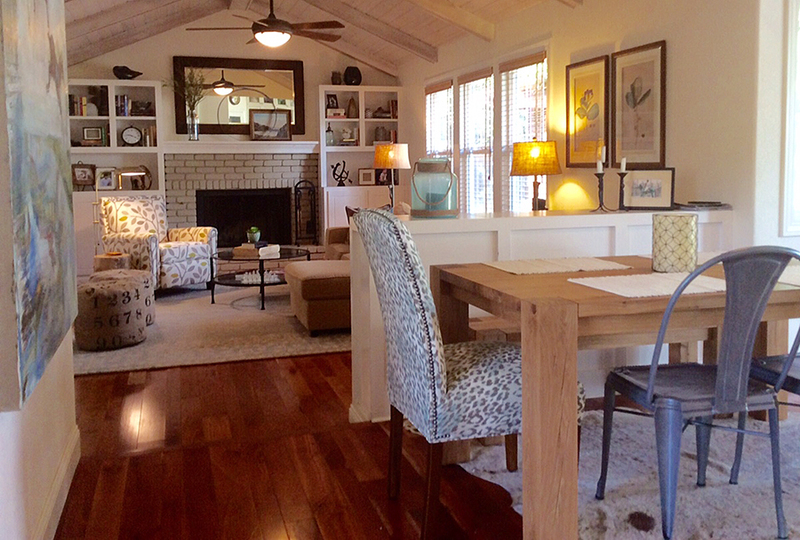 In interior design and decorating, details are the difference between a beautifully finished home and a boring home. 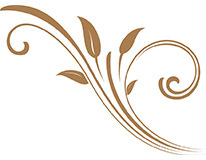 Let’s start this story right… Details are the “icing on the cake,” the “cherry on top” and the “cream of the crop.” Of course, you make many selections in your home, like cabinets, counter surfaces, tile and flooring among others. Space planning and functionality are paramount as well as inviting spaces that are comfortable and approachable. But those finishing touches—the details—tell the whole story. 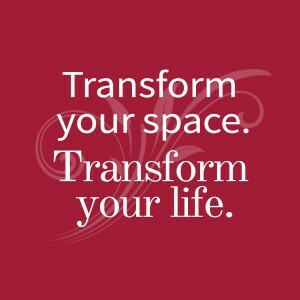 Let’s make those spaces pretty too! 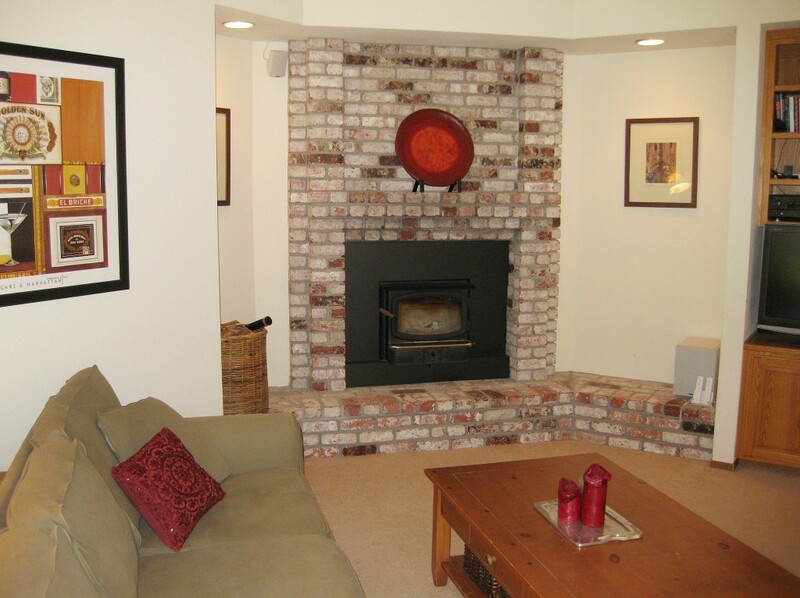 Your home offers many areas for those little details that provide maximum impact. Here are SIX important areas where you should pay attention to the details. Coming home after a long day to an unorganized and cluttered space can be exhausting. 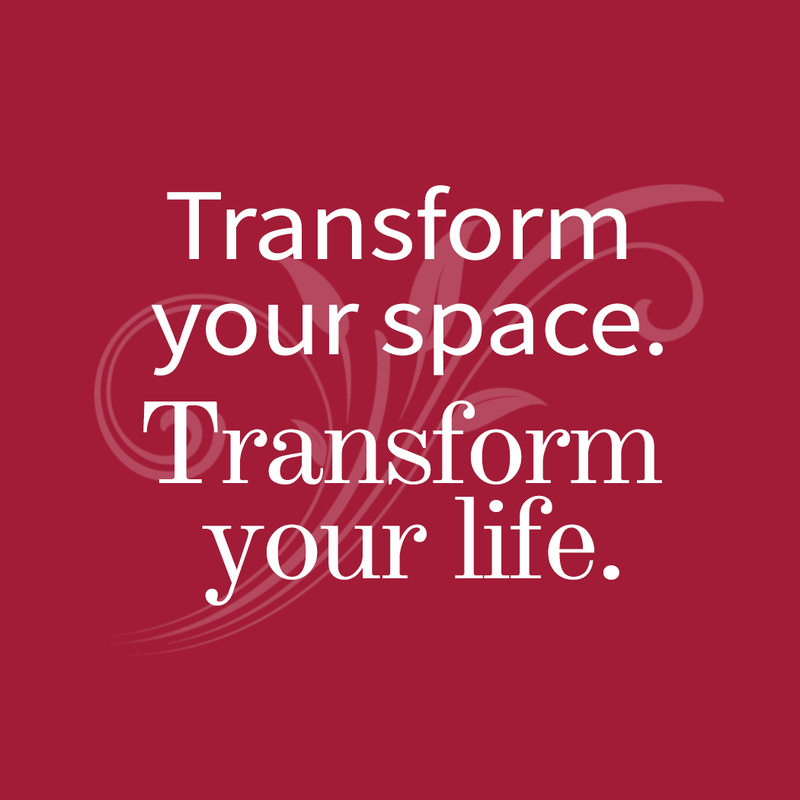 De-cluttering creates more space and a calm environment. It’s a detail that will not go unnoticed! Art is personal, playful, beautiful and dramatic. Display your pieces in their best viewing opportunity; individually or in a grouping. 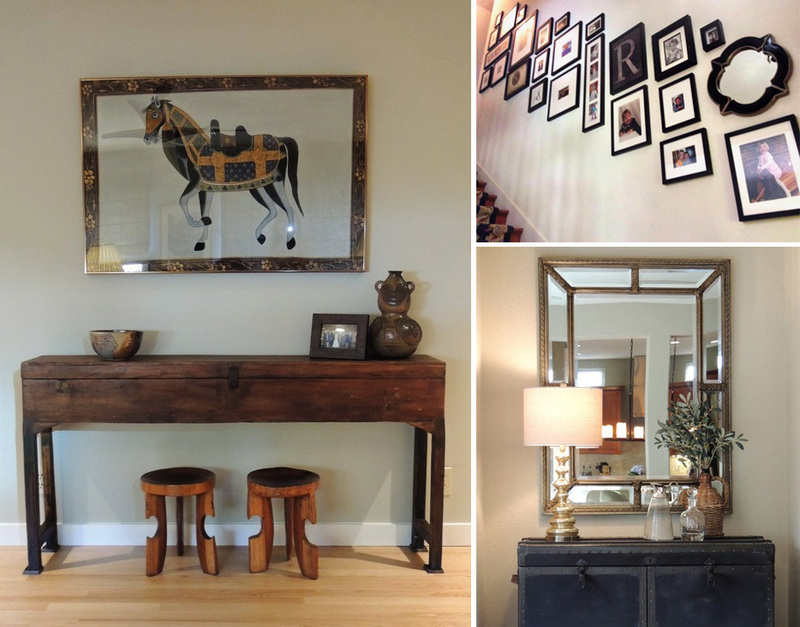 Art and mirrors help promote the feel in a space and are visual features that make a big impact. A mirror is an art object in itself and is often used for functional purposes but appropriately placed, reflects light into the room, reflects a perfectly placed piece of art or a wonderful view. Don’t place a mirror where it reflects a less than desirable view when viewed from adjacent rooms. Pay attention to the height when hanging art. 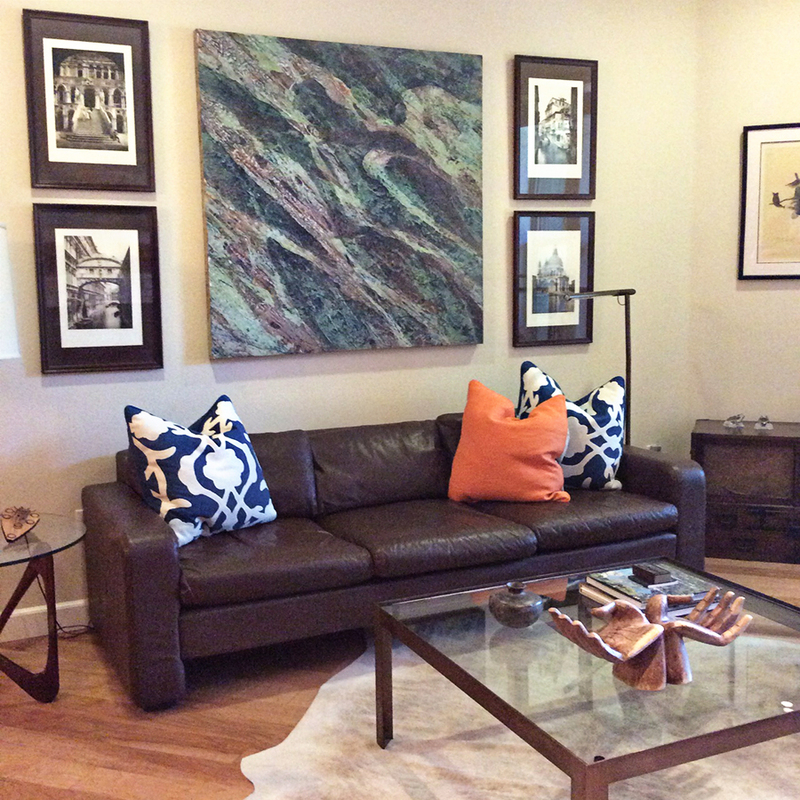 Art is hung on center at eye level (around 60-62” typically) but that can vary. And, make sure that your art and mirrors are hung level. Don’t underestimate the impact of lighting. Light fixtures and lighting are one of the most important aspects of your home, and it is an aesthetic detail you don’t want to ignore. Of course, lighting has many purposes and those should be considered when making your selections. Select the right decorative pieces to complement your furnishings. Accent pillows bring color, texture and pattern into the room. Pillows are an accessory that you change with the seasons. Place a tray on your coffee table or ottoman and stack a few books; add a candle or a sculpture. Fresh flowers always bring enjoyment and life to the room. 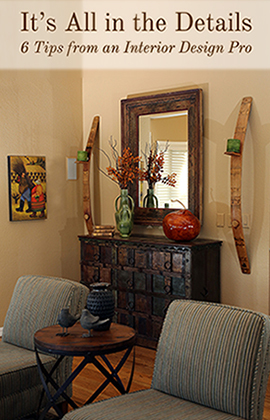 Decorate your mantle with an odd number of objects; lean a mirror or small framed art. Incorporate objects and photographs with the books on your bookshelf, and don’t be afraid to stack the books instead of stand them. These little details have major impact! This may not be recognized as a detail, but it should be. Fixtures are works of art. The faucet is the exclamation point on your sink! Why not make it pretty –that sink gets a lot of use. A simply beautiful bathroom fixture is the jewel in the room. What about the master bath shower? All kinds of fixtures and gadgets are available to help your shower experience be an enjoyable one. You’ll notice, others will notice. Many selections are available in several brands, styles and for any budget. Make selections for effective function, but also, if you will, as a showstopper. In my book, paint is a detail. Color gets noticed. 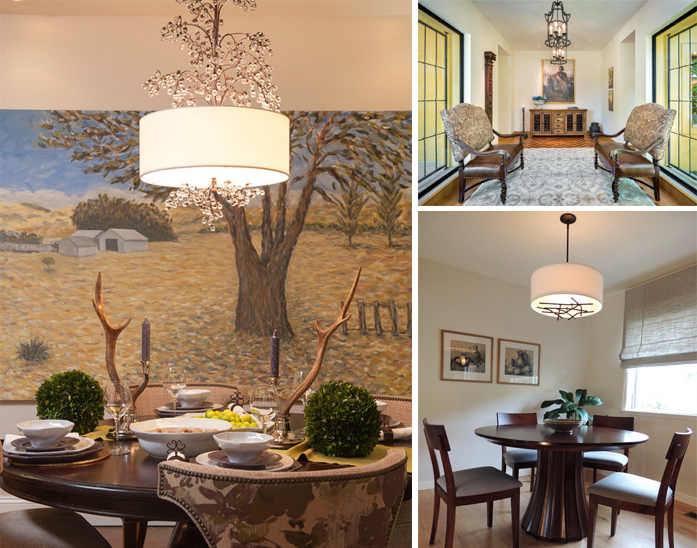 It sets the mood in a room, highlights artwork and enhances the architectural details. We all view color uniquely and it reflects your personality and style. It’s your home, enjoy what makes you happy! 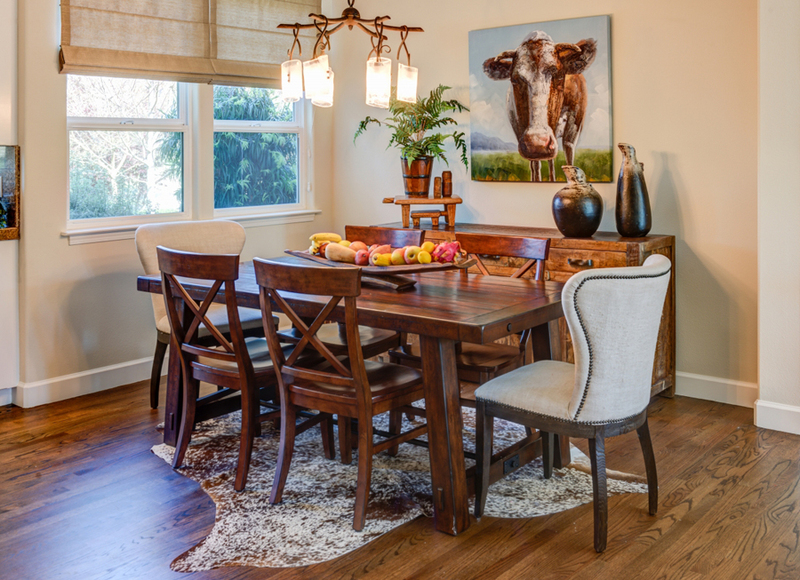 Try using a cowhide rug under your dining table. If your table “floats” in the room, a cowhide’s irregular shape will help define the space in a softer fashion, yet make it feel larger without the harsh angles of a typical area rug. 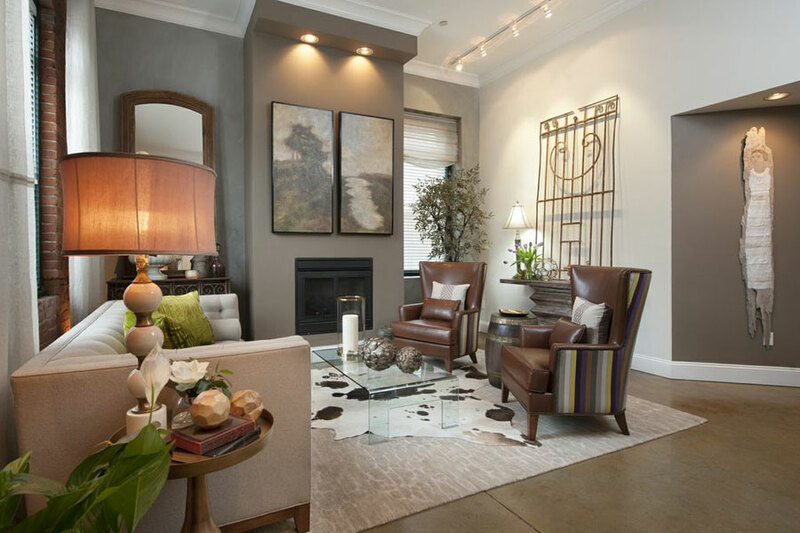 A fabulous cowhide placed over an existing area rug is an unexpected look that brings in contrast and texture. 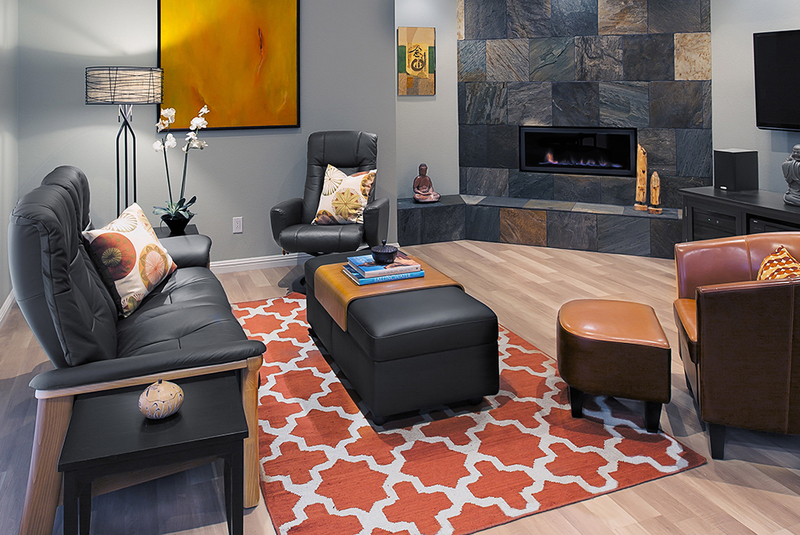 Placing a cowhide in front of your fireplace is a modern look with a touch of rustic comfort. Pair it with other textures in the room, light the fire and ahhh…perfect. 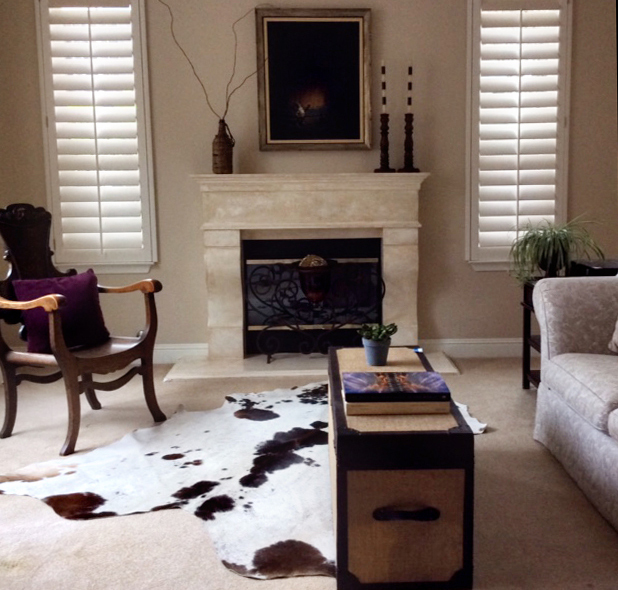 Place a cowhide under your coffee table. Under a glass coffee table presents a sophisticated look and allows the visual glory of the pattern and texture to be front and center. 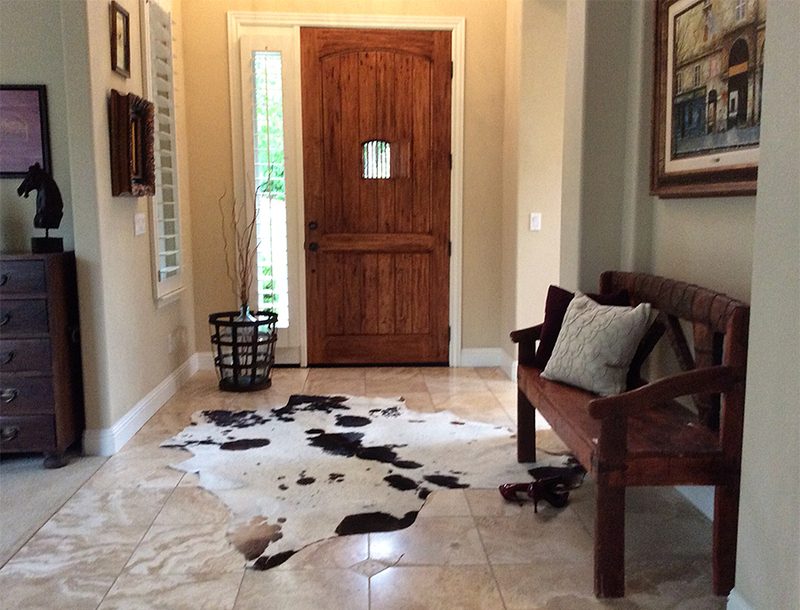 How about placing a cowhide in your entry way? This look is a bold statement upon entering the home. A WOW look! 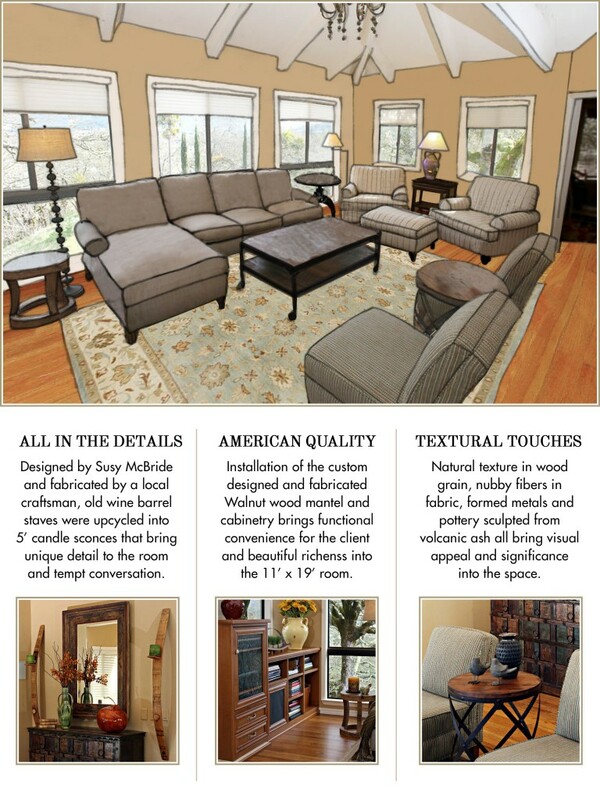 This sketch of a Sonoma County living room design will give you a feel for how we work to meet the needs of our clients. It’s all about listening carefully to understand how you use the space, your style aesthetic, the scope of work and the services necessary to make it happen, then applying our design expertise to a detailed plan that brings your vision to life.